Designed for elementary tumbling. Two foot panels and two foot folds.Color Choices: Choose from 14 school colors, in solids or alternating panel colors. Top quality 2" thick bonded foam mat designed for comfort and moderate support. 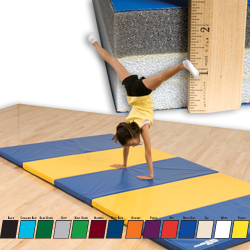 Perfect for tumbling, exercise, play and low impact gymnastics by elementary and middle school age children. Nylon reinforced tough 18 oz. vinyl cover uses double reinforced, nylon stitched inverted seams to create a smooth working surface. Each mat has 2' panels and 2' folds. Specify Color(s) when ordering! * Call us for freight rates on large orders. Combines the Soft Cushion of Polyfoam with the Firm "no bottoming" Trait of Polyethylene! Perfect for young tumblers in their beginner or intermediate stages. The Expando Nova Duo Mat offers a 1" layer of polyfoam which provides the softness for younger, lightweight children, while a firmer 1-3/8" polyethylene layer keeps the mat from "bottoming out" during more extensive use. Nylon reinforced tough 18 oz. vinyl cover uses double reinforced, nylon stitched inverted seams to create a smooth working surface. 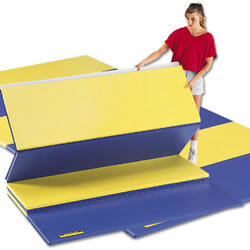 Each mat has 2' panels and 2' folds and are lightweight for easy handling and storage. Designed for beginner or intermediate tumblers Fasteners on ends only 1 3/8" cross-link on one side and 1" polyfoam on the other side. Specify Color(s) when ordering!